Dr Elizabeth New BA (Exeter), MA (York), PhD (London) is a Fellow of the Society of Antiquaries and a Fellow of the Royal Historical Society. Her research interests focus on high and later medieval England and Wales, especially its social, cultural and religious history; the visual and material culture of medieval Britain and northern Europe; and heritage studies. 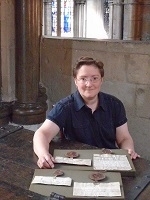 Dr New is Co-Investigator of the AHRC funded* Imprint: a forensic and historical investigation of fingerprints on medieval seals* project https://twitter.com/Imprint_Project She is also a member of the Library & Collections Committee of the Society of Antiquaries of London, an advisor to the British Academy English Episcopal Acta *project, Chair of *Sigillvm (the international association for the study of seals), and a member of the Aberystwyth University Special Collections Committee. Seals and sealing practices in medieval Britain. Approaches include cultural and social history; administrative and legal practices; local studies; imagery and semiotics; cross-cultural and trans-national exchange; archival, museum and historiographical studies. Religious and devotional practices in later medieval England and Wales, especially the material and visual culture of devotion, guilds and fraternities, Christocentric devotion. Dr Elizabeth New works on the social, cultural and religious history and material and visual culture of medieval Britain, and on aspects of heritage studies. She has particular interests in representation and identity among non-elites, the manifestation of Christocentric devotion, and in the form, function and uses of medieval seals. Dr New is in the final stages of an edition of the records of the Jesus Guild in St Paul's Cathedral (Oxford, Bodleian Tanner MS 221), which provide valuable insights into socio-economic networks and the 'economy of salvation' on the eve of the Reformation. Dr New also continues to work on aspects of the Holy Name (the subject of her PhD) in relation to expressions of Christocentric devotion. Seals and sealing practices form a significant strand of Dr New's research activities, and she is currently working on a major monograph which utilises sigillographic material to investigate the construct and expression of identity (personal, familial, communal), status, devotional practice and literary awareness in England and Wales, c.1200-1400. She is also working on a series of publications that highlight how a holistic approach to seals and sealing practices, and in particular their full integration into medieval studies, can provide new insights into society and reveal important nuances of cultural meaning. Dr New is Co-Investigator for the AHRC-funded Imprint: a forensic and historical investigation of fingerprints on medieval seals project, and previously was Senior Researcher for the AHRC-funded Seals in Medieval Wales project. Dr New has a range of interests relating to heritage, material culture, and historiography. Current projects include a study of a group of medievalists during the period of the 'professionalization of history', and collaborative projects editing a depositions roll that provides a rare snapshot of life in the early 16th century, and investigating patterns of burial and commemoration in St Paul's Cathedral. Reconsidering the Silent Majority: Non-heraldic personal seals, identity and cultural meaningNew, E., 2019 , A Companion to Seals in the Middle Ages. Whatley, L. (ed.). Leiden: Brill, (Reading Medieval Sources). Medieval Londoners. Essays to mark the 80th birthday of Caroline M. BarronNew, E. & Steer, C. (ed. ), 2019 , (Accepted/In press) London: University of London. ‘‘By the impression of my seal’. Medieval identity and bureaucracy: a case-study’New, E. & Hoskin, P., 2018 , (Accepted/In press) In : Antiquaries Journal.